Maybe you absolutely love Instagram and can't wait to share more photos of your work. Maybe you loath social media and it's like pulling teeth to come up with a good photo and caption to post. Maybe you're somewhere in the middle, and Instagram has become one of those things "you just gotta do" for you and your salon. Whatever your relationship with it, the truth is that Instagram has quickly become the top place to get your beauty business discovered online. If your salon doesn't have an Instagram page yet, run over there and get one, girl! If you're already on Instagram, you're probably here because you know that Instagram is important, and you're looking for a way to have more of the right people in your city to discover you. Instagram has a leg up over Facebook in that people who have never heard of you can discover your photos, fall in love with your brand, and then become a loyal client. The absolute best way to do this is through using the right hashtags. Not just any hashtags, THE. RIGHT. HASHTAGS. Using the right hashtags you’ve discovered through research is the right way to make them work for you. Don’t just use random hashtags! In this post I'll show you exactly how hashtags work to help people discover your posts, how to research the right hashtags for your specific city, and some freebies to improve your overall Instagram game for your beauty business. Let's dig in! We all know that hashtags work for helping your content to get discovered, but many of us don’t know exactly HOW that works. It’s important to understand how hashtags work in order to understand the best hashtags for you to use for your beauty business. So, when you post a photo or video, it gets submitted into Instagram’s algorithm. Instagram is like Facebook in that it decides how many people and who will see you post based on things like engagement, likes, comments. If you post a great photo, it’s more likely to get likes and comments, which will then signal to Instagram that it’s high quality, so even more people will see it and you’ll get even more engagement. It’s a snowball effect. When you use hashtags, you’re expanding the reach of your posts because people outside your own followers will see your stuff. They’ll discover you because they see your post on the page for the hashtags they follow (you’ll see what it looks like later) and on the discovery page under posts they might be interested in. I have also found that my posts get seen by more of my existing followers if I use hashtags vs not using hashtags. Instagram, like Facebook, never gives away its exact algorithm, but the point is this: you need to use hashtags on Instagram or you’re only using it to half its potential. But here is where many salons go wrong: they’re using the wrong hashtags. Before you start posting photos and videos with random hashtags you saw on someone else's post... it's time to slow it down and think about a strategy. If you use hashtags willy-nilly you risk missing out on potential followers, looking spammy, and worst of all you risk having fewer people see your posts if your hashtags have been marked as spam by Instagram (source). The best way to find your ideal hashtags is do some intentional research about your target market, your city, and your beauty niche. Here's how to do it. At the bottom of this post you can download an awesome freebie. I've created a spreadsheet you can use for your hashtag research and find your best hashtags. All you have to do is keep track of which hashtags you used each week, and experiment with different types of hashtags. I give you different ideas to try each week, and examples of hashtags that you can use. The best way to improve is to see where you're coming from. On the first page of the spreadsheet, in the first column, write down the hashtags you've been using most recently. Then in the comments make note of your average engagement, likes, comments, and average reach. Also be sure to make note of how many people saw your posts from hashtags - you can see all of this by tapping "view insights" under each post. I've seen so many salons make the mistake of ignoring their local city-based hashtags on Instagram. Do not make that mistake! Your target clients in your city are within reach if you just find the right hashtags to connect with them. Let's look at a few ways that you can research popular and relevant hashtags in your city. First, find the most basic hashtag for your city or area, which will probably just be the name of your city. For example, #toronto. Next, when you look at the top posts for #yourcity, check out what other hashtags people are using related to the city. They might be things like #torontolife #torontostyle #blogTO. Write all of these down in your spreadsheet under "local hashtag ideas"
Then, see which suggested hashtags you get when you search #yourcity... in Instagram. Write those down, too. Next, check up on other local businesses in your area, especially if they have a prominent presence on Instagram. Do they use any hashtags that you missed? Write 'em down! Another great trick I found is to search Google for the top bloggers in your city; you can be sure they're on Instagram, too, and they know exactly which hashtags are popular in your city. In the spreadsheet I made (download it for free at the end of this article!) I give you ideas for new hashtags to try each week. The important thing is to experiment and to keep track of which hashtags work better than others. 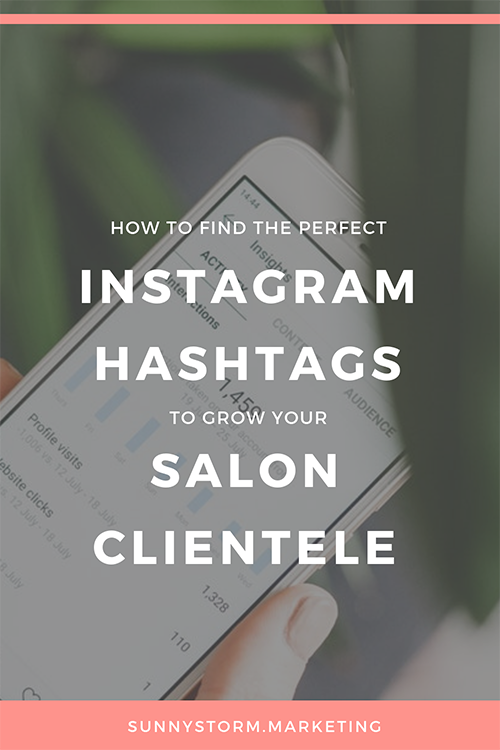 Once you get a better idea of which types of hashtags work best for your salon, you can continue to experiment with individual hashtags. Never stop learning and try not to use the same hashtags all the time (I talk about why later in this article). Now, read on to find out more about which hashtags you should try and which you should probably put to rest. The more popular a hashtag is, the harder it will be to “compete” for it. Meaning, the less likely you’ll show up in the top posts for this hashtag, and the less likely people will discover your post. These top posts have more than 1000 likes and have been posted in the last hour! Within a few hours, they'll be gone from their top position. The point is, to have your photo discovered for this hashtag is doing to be pretty darn hard. 78,000 is MUCH more manageable. Since there is less competition for this hashtag, people are more likely to find your content. They’re also less likely to search for it, unfortunately. As you can see, choosing the right hashtags is not always so easy. You want the hashtag to be popular enough that people will actually search for it, but not so popular that it will be impossible to have your post surfaced among the millions of other posts. In general, it's recommend that you stick with hashtags with a million or less posts in that category. And the best way to do this is to uncover the most popular hashtags in your niche or geographic area. But remember, the most important thing is trying things out for yourself, and that's where hashtag research comes in! I mentioned it earlier, but no one knows exactly how the Instagram algorithm works. One thing that we're not SURE about but is worth mentioning is this: you may need to switch up your Instagram hashtags for every post. Meaning you probably shouldn't copy paste the same hashtags and use them for every single one of your posts. There is a chance that Instagram sees this as "spammy" and may affect how many people see your photos and videos (source). Even though you may think this doesn't affect you, it's worth considering that your posts probably should have different hashtags depending on who they're for. If you're promoting your facials one week, and balayage the next week, it makes sense that you would change who you're targeting and which hashtags you use. Where should I put my hashtags - in the caption or comments? Taking great pictures is the start of any good Instagram post. I talk more about that in my article about developing your own visual theme for Instagram. Once you’ve taken a great photo, it’s time to caption and hashtag it. First of all, your caption should be friendly, personable, and descriptive. Write like you would in real life, and put some humour or personality into it. You should also tag your clients, staff members, and products used in both your caption and the photo itself (tap on a photo to tag someone). You can do a mix and put one or two ultra specific hashtags in the caption and the rest in the comments. Of course, the biggest question is: Does it really make a difference where I put my hashtags? The answer: no, it doesn’t make a difference and it’s a matter of personal preference. Some people think that adding a bunch of hashtags right inside the caption looks spammy, while others prefer it. Wherever your hashtags are posted they will have the same effect. Just make sure to include them! I like how she used an ultra-specific hashtag in the caption of her photo, then in a comment below include her researched hashtags. Adding ultra specific hashtags can be a fun way to inject some personality into your posts. It shows you have a sense of humour and that you’re a real human being. If they’re specific to your photo it makes your caption feel more authentic, too. Incase you're wondering what a good hashtag strategy ACTUALLY looks like, here's an example. 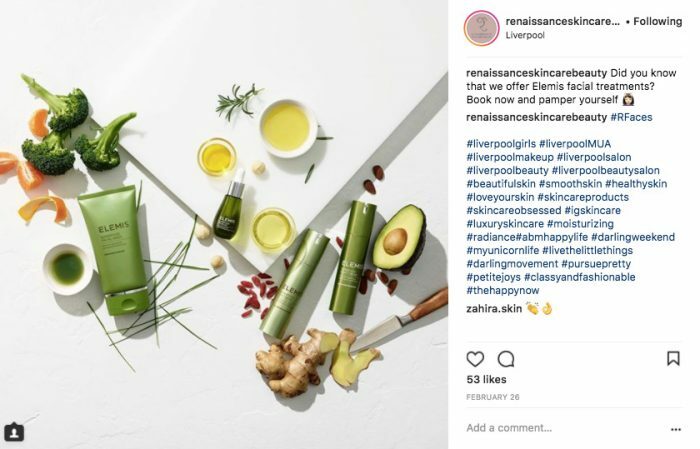 This is a post that our social media manager, Diana, did for one of our Instagram clients, a beauty salon in Liverpool, UK. LOCAL: The first few hashtags target people locally, especially local women interested in beauty. MILLENIALS: Finally, we also used a also a good mix of more general hashtags that define beauty, elegance, and class on Instagram for a younger audience. These are medium-competition hashtags with several million posts in each category, but they’re not so general as #beauty. Starting with a strategy like this is a good first step for your own Instagram posts. Just make sure to keep track of your hashtags (I’ve created a handy spreadsheet freebie for you below) and do your research! Once you’ve done your research for your local hashtags, then you can venture into broader hashtags for your beauty business. Here are some helpful lists of hashtags I’ve found for you, no matter which beauty sector you’re in.